Poker Chip Boxes, Poker Chip Racks, & Poker Chip Spacers! Choose from a variety of Poker Table Accessories, all available for immediate shipment. We carry Poker Chip Boxes, Poker Chip Racks, Poker Chip Spacers and more. For our FREE 104 Page Casino & Game Room Supplies Catalog, please contact us at 1-800-233-0828. 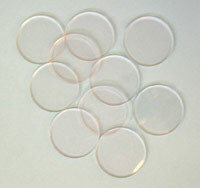 Clear, acrylic chip spacers are available. 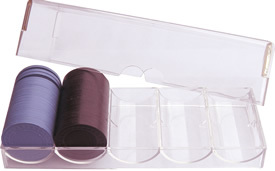 These chip storage boxes are made of clear plastic, and they hold 100 chips (4 rows of 25 chips). Each chip storage box comes with a secure cover. Sale Price: $1.99. Was $3.00. Save 30%!